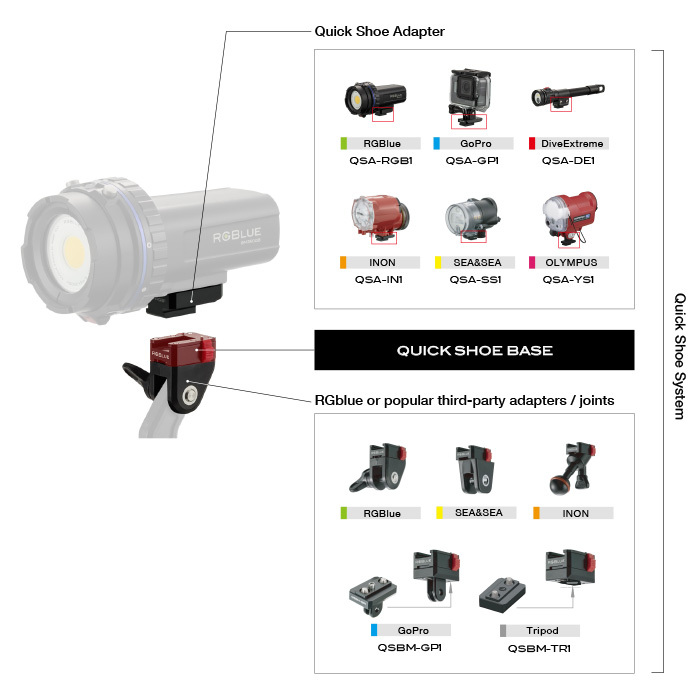 By combining the Quick Shoe Base with a Quick Shoe Adapter (7 types) and a Quick Shoe Base Mount (2 types), you can build a convenient shoe system that allows you to instantly attach or remove an RGBlue light or popular third-party strobe, light, or wearable camera. This system is especially useful when you need to replace or remove the light source battery, as well as when setting up other equipment where you need to do it quickly. The core component of the Quick Shoe System, this can secure an RGBlue adapter, popular third-party adapter, or joint onto the bottom surface using the built-in bolts. Material : Aluminum, polycarbonate, etc. *The optional Quick Shoe Base Mount GP1 is required. *The optional Quick Shoe Base Mount TR1 is required. Provided with built-in bolts to secure compatible products. In combination with the Quick Shoe Base, these adapters allow you to instantly attach or remove RGblue or popular third-party adapters/joints and lights/strobes. Designed to be secured to the bottom of the Quick Shoe Base with the built-in bolts. One type makes it possible to mount the Quick Shoe Base onto a GoPro standard accessory or tripod. Attachment and removal can also be accomplished instantly. Allows you to connect a GoPro standard accessory when attached to the bottom of the Quick Shoe Base with the built-in bolts. One-touch connection and disconnection of a GoPro accessory is now possible. *Specifications may be subject to change without notice. *GoPro® is a registered trademark of Woodman Labs, Inc. in the United States and other countries.